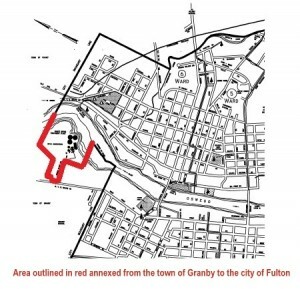 FULTON, NY – The two-year legal land battle between the city of Fulton and the town of Granby was put to rest last week when the Fulton Common Council took the last step and voted to approve the new city map, which now includes the Wastewater Treatment Plant on city-owned property. Town of Granby Supervisor Edward Williamson said on Tuesday (Sept. 9) that there is only one step left in the process for the town, but the deal is sealed. “Letters have been sent to Senator Patty Ritchie and Assemblyman Will Barclay to put the state stamp of approval on the final transactions details,” Williamson said. Those details include a land transfer of approximately 8.3 acres of land adjacent to the Wastewater Treatment Plant along the Oswego River to the town of Granby. The plan includes creating a public road that leads to the sewage treatment plant, then an access road that goes to the riverfront property so town residents can get to the water. “But all that has to wait until such time that the senate and assembly goes back in session, which is the first of January, I believe,” the supervisor said. As was reported in May, the final decision that the Fulton Wastewater Treatment Plant could become part of the city was announced after a two-year legal struggle. The New York State Court of Appeals in a memorandum and order unanimously concluded that the proposed annexation was in the overall public interest and recommended granting the city’s petition. for the proposed annexation. The city of Fulton carried the burden of proving why the annexation was in the overall public interest and the referees said in their advice that there was no question that the annexation would significantly benefit the city. The decision notes that the town agreed that the increased tax burden on its residents would be “minimal,” with a projected increase of only about 7.5 cents per $1,000 of assessed valuation. Noting that because the city already provides full time police and fire protection, water and sewer, and road maintenance to its treatment plant facility, and is better able to handle chemical spills or other emergencies – even though the property is located outside the city limits – the referees said annexation would also benefit the territory overall. The issue of annexing the city of Fulton’s sewer treatment facility began in 2012 when the state raised the assessed value of the plant and the land from $3,012,047 to $3,934,044. Based on the higher assessed value, the city was responsible to pay more than $116,000 a year in county, town, school, fire and highway district taxes. Williamson said during a public hearing in 2012 that the town did ask the state to reduce the tax assessment on the treatment plant property, but the state refused. According to town and city records, the town was able to wage its legal defense of the property using its in-house attorney for approximately $12,000; in its successful effort to relieve the taxpayers of the approximately $116,000 yearly tax burden, the city spent $246,586.42 as of March 2014. As a city-owned municipal property within its own taxing jurisdiction, the plant can now be considered wholly tax exempt. Time for this to happen, it was introduced by the council back in the 90s. Now everybody else will have to make up for the lost taxes. The bottom line is that a municipality should NEVER be taxed for a utility service that is owned by the public. This is a small step in assisting the financial needs of Fulton and hopefully will reignite the working relationship between the Town of Granby and the City of Fulton. The fiscal restraint of the Town Supervisor and the Town board ensures that this impact will be very minimal, if at all, and the gains for the Mayor and Council of the City assist them in restructuring the financial needs of the City. Hopefully this will re-energize the importance of business development both in the City and along the State Route 3 Corridor in Granby. The winners here are not the egos of individuals but the taxpayers of both communities, one with restraint and one with some finical relief. So Mr. Karasek, This should mean that Fulton will lower the sewer tax to reflect their property tax savings. My guess is that they will not drop the price and that the tax payers will still have to make up the lost taxes to the School. The Mayor likes to cry about tax exempt (like CCC buying the P&C Plaza…can you say KARMA?) property except when it benifits him.